I live in the desert of New Mexico and we have ants everywhere in the summer. They are outside and also inside the walls of many peoples homes. My husband says that our house was built on an ant hill. I used to use ant preventive sprays but not anymore. As sprays just keep them out. 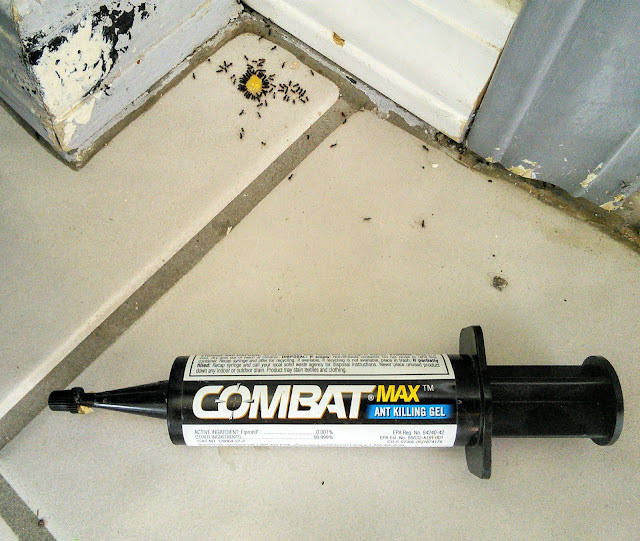 I now use a product that kills the ants and their hives. Two years ago, I discovered a great product that works awesome in taking care of my ant problem. Combat makes a great product called Source Kill Max and I can say it works great. This easy to apply gel comes in a syringe-like tube and has a resealable cap on it so you can get many uses out of it. I received this product for a Review two years ago and thankfully there was still product left in the tube for me to use tonight. 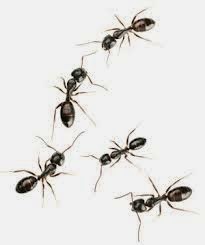 Unlike sprays that kill only the ants, it sprays Combat Source Kill Max has a fast-acting active ingredient that's speed is still slow enough for the ants to ingest it and take it back to the colony to feed to all the ants including the queen. The entire colony is killed. That means no more ants. You just simply apply the gel to areas where you see ants and the ants eat the gel. They carry it back to the colony to feed everyone else. I placed the gel on the floor and an hour later there were tons of ants eating the gel. The bright yellow spot is the gel. You can see the ants forming around in other places and that is spots were the ants have almost eaten all the gel. It is amazing that I put the gel out and within 24 hours the ants are gone. Yes, you do have to leave the ants alone and let them eat the gel so don't clean up the area as the ants are making scent trails to lead other ants to the product. Ever since I started using this wonderful ant killing gel, I have had fewer ants in my house. I still have ants by my front and back doors a couple times a month but the ants no longer spread to other places in my house. When I notice the ants, I just apply the gel and the ants are gone in 24 hours. I purchase this product on Amazon but you can also find it in stores like Walmart and Home Depot. To get more information on Combat Source Kill Max and to find out where to purchase, click the below link. "These opinions are my own and I was sent the above-mentioned product in 2012. I continue to use the product as it works great." Oh this time of year comnbat strips are OUR BEST FRIEND!!! Ants just started coming in and I need to get something. I will look at Lowe's for this. I used to live in a house that was build on land that used to be orange groves. Come summer and the ants just invade. Wish I knew of CombatBugs back then. I hate ants - hate 'em! We had a group setup a colony in our power strip and it was so creepy trying to get rid of them. I hope we don't have to deal with them again this year but if so, I know what I'm going to try. I will definitely be trying this if our ant problem returns! Thank you for sharing. I just hate ants! We had them in the kitchen a few years ago & it was awful! since we moved into our house 6 years ago we never had much of an issued with bugs other than the occasional fly in the house and the house centipedes in the basement the last couple years. Then the other day I was sweeping under one of the radiators and swept up two ants from underneath it. That freaked me out a bit. I hate ants! Right at this time of year, we tend to get some I need to try these for my house! Living in the country, I can certainly relate to the ant problem. We don't have them too bad, every once in a while a trail finds their way in! WOW! 2yrs! That is impressive! I haven't used that before, but we had an awful ant problem last year...it literally gave me nightmares. I can't stand them...it took us probably 2 weeks to fully get the issue out of control. We had early warm weather, so I think they got active earlier than usual and just attacked the kitchen. Will have to remember this product. That is certainly an achievement there. Fighting ants is no mean feat. Not only are they small enough to evade assaults, they are also pervasive. It will pay to be more encompassing with the pest control, and of course to be a bit more resolute about it more than anything. All the best to you! Wow, I've never heard of that before. Will definitely need to check it out this summer when it warms up! I used this 2 years ago and have not seen an ant since then.